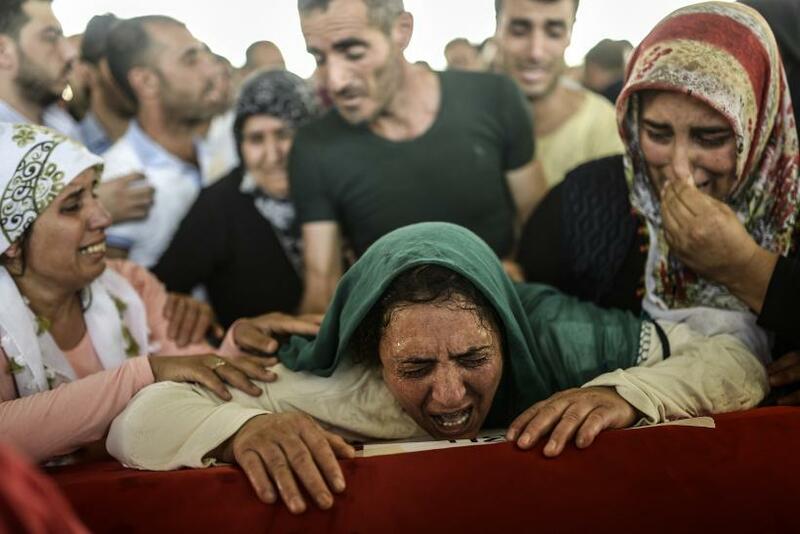 Turkish authorities have identified a suspect in Monday's deadly bombing in the Turkish town of Suruc near the border with Syria, Prime Minister Ahmet Davutoglu said Tuesday. The attack left 32 people dead, many of them young left-wing activists who were volunteering to help rebuild the Syrian city of Kobani, a Kurdish city that experienced intense fighting in 2014. Without releasing the suspect’s identity, Davutoglu said there was likely a link between Monday’s bombing and the Islamic State militant group, which controls territory on the Syrian side of Turkey’s porous border. "All the [suspect's] links internationally and domestically are being investigated," Davutoglu said during a press conference on Tuesday. Local officials vowed swift justice, and Davutoglu said he expected the investigation to conclude promptly. “As I underlined yesterday, the probability of [the attack’s] link with the Islamic State and the suicide bomber has intensified,” Davutoglu said, according to Hurriyet Daily News. At the same time, he urged patience and said the investigation must first conclude before a connection to ISIS is known. Unverified reports in the international and Turkish media are alleging that a female militant who apparently crossed the Turkish border in June was behind the attacks. In June, three ISIS members reportedly crossed the border, prompting the Turkish General Directorate of Security to warn that an attack was possible. It was not the first time a female ISIS sympathizer was believed to have staged an attack in Turkey. In January, a female suicide bomber targeted a police station in Istanbul, injuring two police officers, one of whom later died from the injuries. It was believed that she was a lone-wolf ISIS sympathizer, though police continued to investigate her motive. Monday’s blast targeted the Amara Culture Center, run by the local municipality under the control of the Peoples’ Democratic Party (HDP), a Kurdish left-wing party. The center has frequently hosted volunteers and journalists visiting the southern Turkish town of Suruc. At the time of the explosion, hundreds of socialist youth were holding a picnic at the center. Following the attack, Turkey vowed heightened security along the border with Syria. ISIS militants have not yet claimed responsibility for the attack.